In 2016, I was among the very few to predict a Trump landslide. In, fact, I didn’t just predict it, I nailed it! Article here. In tomorrow’s voting, I am predicting that the Republicans will maintain majorities in both Chambers of Congress, losing a few seats in the House and gaining a few seats in the Senate. I don’t see the GOP taking enough seats for a 60-seat, filibuster-proof Senate majority, but they could wind up with as many as 56 seats. After all the votes are counted tomorrow night, I believe the Republicans will finish with 220 to 230 seats in the House, maintaining that majority as well. UPDATE: I got the Senate about right, but was a little off on the House, resulting in a Democrat majority, which is horrible, in my opinion, as it not only means probable congressional gridlock for two years and endless investigations of President Trump in an attempt to impeach him (with no chance of conviction), but will also give the Democrats and their official Communications Division, aka the mainstream media, plenty of lies with which to bash President Trump for the next two years. I am actually shocked that the House changed hands. I really thought the outrage over Justice Kavanaugh’s unjust treatment and the Russian collusion fairy tale would impact the Democrat Party in a much more negative way, but I guess it’s true – Democrats can do anything, no matter how immoral or unethical or illegal, and the brain-dead zombies who follow them will continue to follow them. I had hoped that more of them would be seeing clearly by now. I reckon not. Two key demographics will be responsible for the red tsunami tomorrow that pundits and pollsters are still predicting to be a blue wave. Women and blacks, both of which have abandoned the Democrat Party in huge numbers, will lead the way to major Democrat losses and Republican gains. From powerful anti-Democrat movements like Walk Away and Blexit, liberal Democrats are showing that they have had enough of the corruption and criminality, and are leaving the party of the KKK in droves. The transparent and criminal (my opinion) conspiracy to frame Brett Kavanaugh and attempt to destroy his life for political gain has also angered many former Democrats who are not only abandoning the Democrat Party, but vowing to vote straight ticket Republican tomorrow, which will result in a huge swing in the vote total. This prediction does not account for voter fraud, a Democrat favorite, which, hopefully, is being watched for closely enough to make it a non-issue. 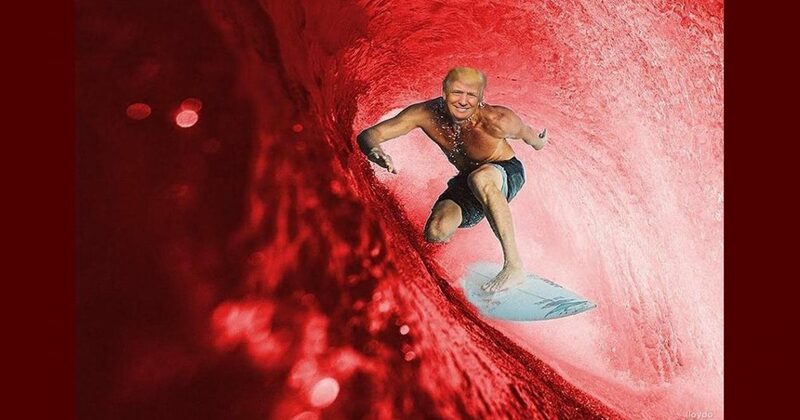 Even more optimistic than me and predicting an even greater red wave, Dr. Gerard Lameiro details his red wave prediction in the following article…. My forecast for the 2018 Congressional Elections – There will be a Conservative Red Wave in the House with 225 – 228 Republicans elected to office and in the Senate with 58 – 60 Republicans elected to office. Let’s look at some of the reasons that went into the forecast. As you remember from my book Great News for America, the presidential election of 2016 was both an historic and critical presidential election that ushered in a new American Constitutional Era that I called the Conservative Era. Long-range trends as well as short-range trends came together to cause a fundamental shift in each of our two major political parties. In addition, other major changes took place as well. Those were predicted and explained in Great News for America. In fact, nine of my ten predictions made in Great News for America came true. Now, the 2018 Congressional Elections continue to build on the foundations of the historic 2016 presidential election. In my newest book, More Great News for America, I make eight new predictions that will happen in the near future. These predictions appear to be happening as we approach the 2018 Congressional Elections and as we soon have a new Congress in place in January 2019. In addition, we have seen an outstanding economy, tempered by considerable volatility on Wall Street. We have also seen the extreme bias of the old mainstream media with 92% of all stories on, or related to, the president, reported from a negative point of view. We have seen President Trump fight back, attacking the Leftist media for their “fake news” and negative news. Finally, we have seen Democrat leaders and well known media personalities stoking anti-Trump rage and confrontations with Trump supporters. What has been the Impact of these Fall Surprises and Other Events? While intended to hurt President Trump and keep Republicans from holding the House during the mid-term elections, all the above surprises and events have worked to enhance the Conservative Red Wave. Instead of creating or building a Blue Wave, the Red Wave continues. Republican Voter Intensity exceeds the much heralded (and Leftist desired) Blue Wave. There has been no Blue Wave this year. There has been no Blue Ripple this year. There has been no Blue Drip this year. Plus, even some Blue Bubbles are bursting. Recall that Blue Bubbles are areas of Blue support, such as a long-time Blue Congressional District in a major coastal city. The bottom line is a Conservative Red Wave is coming in November.